Question: What does one do with oneself when you find you have a little bit of time but the weather is so bad that autumn landscape photography is just not possible – not unless you are a frog! Answer: You revert back to the genre of ‘Still Life’. I decided to have a look around my house for something interesting to photograph. Then I thought what light do I have. My lounge is graced with a large south facing bay window but unless I was up against the window the natural light in the room was still too dark. Having decided to photograph some flowers my wife had put into the window, I decided to take this mini project one step further by incorporating new skills learned through the recent Mid Cheshire Camera Club meetings. Two sessions in particular that I wanted to put into practice was the Macro and Focus Stacking presentation hosted by Jim Cain on the 14th September and because the light was so bad I also wanted to try out some of the Flash Photography theory presented to the Club by Graham Quinn on the 28th September. Setting up my mini studio took about an hour. I wanted to do it slowly making sure I understood what I was doing and why. I have bought myself a few bits of kit but I don’t often find the time nor get my wife’s permission to get it all out and put it up, so this project was allowing me to familiarise myself with equipment bought some months ago and I can say it was a worthwhile exercise. 1. To take a number of correctly exposed images using natural daylight and fill in flash from a Speedlite and reflector. 2. Take a sequence of sharp images with a narrow depth of field when merged together creates a front to back sharp image of the subject. 3. To identify weaknesses in my workflow with a view of finding solutions to improve my photographic process. •	For ease of use, I set the flash to ETTL – its automatic setting. As you may be able to see from the photos (above) of my make shift studio, I changed the reflector position when photographing the Light Meter. Using the Opaque cover of the reflector helped to defuse the natural light hitting the metal surface. The large Softbox provided the fill light. I used the reflector cover as a base to stop light reflecting dramatically off the gloss painted window ledge. All in all, this was an interesting afternoon. 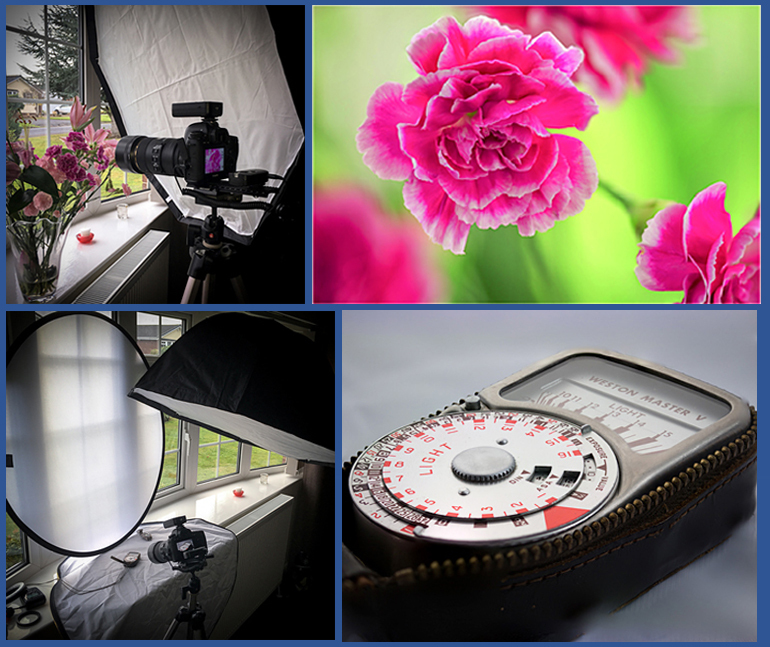 I completed four projects taking three different sets of images of flowers and one set of images of the Light Meter. My results were mixed. You may be able to see on the Light Meter image, areas of soft focus that Photoshop has not been able to render. This may be due to some movement in my shots from the tripod across the 36 images that I took of the Light Meter. The final image of the Pink Flower (below) has worked well. There is front to back sharpness and great lighting on all sides of the flower. Fourteen images were used to make up this final image. Things that I will do in future will include: ensuring my tripod and the floor it stands on is solid. There is a little lateral movement in my focusing rack. I will try the alternative method of using the focusing ring rather than a rack and compare the results. I will use a greater depth of field by reducing the aperture even if I have to increase the ISO, although this should be okay if I am able to use flash. The other thing I learned, especially if using a focusing rack, make sure the end photo which could be 3-4cm closer to the subject is still viewable within the view finder. What I found when taking the last shots of the Light Meter was it was the edge of the subject was being cut off as I got closer. Finally, can I thank both Jim Cain and Graham Quinn for imparting their knowledge and giving me the theory and confidence to try out new techniques.